Earlier in 2018, The Right Honourable Beverley McLachlin, P.C., C.C. 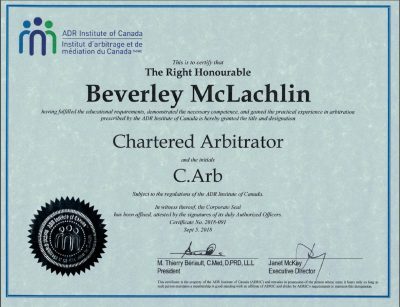 became a member of ADR Institute of Ontario (ADRIO) and ADR Institute of Canada (ADRIC) and applied for the Chartered Arbitration designation. ADRIC is pleased to announce that the designation was awarded on September 5, 2018. We welcome Chief Justice McLachlin to Canada’s preeminent ADR organization and to the Chartered Arbitrator community!